The excitement of this game was left to the fourth quarter as the teams combined for 19 points in the final frame, with the visiting Washington Redskins getting the better of the Seattle Seahawks, 17-10. Rob Kelley scored the last of his two touchdowns on the day with just 1:02 left in the final quarter to re-grasp the lead for the Redskins in what would be the game-winning touchdown. Seahawks QB Russell Wilson led his offense on two late-scoring drives in the fourth quarter, but ran out of time on their last ditch effort, falling short on an incompletion as time expired to give Washington the lead. Wilson previously connected with Luke Willson and Doug Baldwin in the fourth to grab the lead for the first time since the second quarter for the Seahawks, as Wilson finished the game completing 24-of-45 passes for 297 yards with his two touchdowns, but also had two costly interceptions. He was, for the second consecutive week, also the team’s leading rusher. Kelley may have scored two touchdowns for the Redskins, however his 18 yards on 14 carries showcased the Seahawks defense’s prowess against the run, but without safety Earl Thomas, Redskins QB Kirk Cousins connected on 21-of-31 passing for 247 yards including six receptions from veteran TE Vernon Davis for 72 yards. With that, we give you our PFF exclusive takeaways from the contest for each team. In a game where he was sacked six times, Cousins and Co. had a tough time getting the offense in a rythm throughout much of the game. Although when the game was on the line, the Redskins quarterback made two clutch throws which put Washington in position to win. Cousins numbers weren’t overly impressive, completing 21-of-31 passes for 247 yards but it was the high accuracy under pressure that was as he completed 7-of-9 for 100 yards in those instances. Due to the high pressure throughout the game, Cousins often had to get rid of the ball quickly and 18 of his 31 passes traveled under 10 yards. He was 2-of-5 on deep passes with the two completions the most important ones, coming on the final drive of the game. Doctson was only targeted four times throughout the game and his 59 recieving yards aren’t eye-popping but his full extension 38-yard reception on Washington’s final drive that put them in position to win. Doctson struggled to get open while Richard Sherman was opposite him, catching only one pass on two targets for 11 yards. Doctson has yet to blossom for the Redskins as he has only 11 catches on 20 targets through seven weeks. DeAngelo Hall made an immediate impact upon return to the gridiron this week by having the highest graded performance of the Redskins defense. Hall played mostly deep safety so he was no targeted often (only three times), but he came up with two pass defenses, one of which sealed the game on the final Hail Mary attempt by Russell Wilson. Although McGee only played 31 snaps on defense for the Redskins, he made a solid impact as a pass-rusher with a 82.0 pass-rush grade. He only had one hurry on the afternoon, but he consistently beat his inside counterparts quickly and forced Wilson to bail out of the pocket before he got too close. McGee was also a factor in run defense coming up with two stops on 14 snaps in run defense. Doug Baldwin was easily the best offensive player for the Seahawks on Sunday afternoon. Baldwin had seven receptions on 12 targets for 108 yards and a touchdown. Baldwin also had another large gain negated by a Seattle holding penalty. He had the biggest play of the game for the Seahawks offense when he beat Josh Norman clean off of the line of scrimmage in man coverage and scored an easy touchdown to put the Seahawks ahead late. With Eddie Lacy going down early with an injury, the main rushing responsibilities fell to Rawls. Seattle was behind and throwing the ball for the majority of the time Rawls was in the lead back role, but he did the most with the carries he was given. Rawls gained 39 yards on nine attempts, 19 of which came after contact. Rawls showed good cuts out of the designed holes to gain more than his blocking gave him, and looked fine to carry the load if Lacy is out next week. The All-Pro linebacker put together another great performace, albeit in a losing effort which was no fault of his. He had five stops in run defense which led to an 85.0 grade in that category but it was his coverage ability that was perhaps more impressive, surrendering three receptions on five targets for only seven total yards and breaking up a pass. Rounding out his impressive performance he recorded a sack and hurry while rushing the passer, capping off a solid game in all facets. 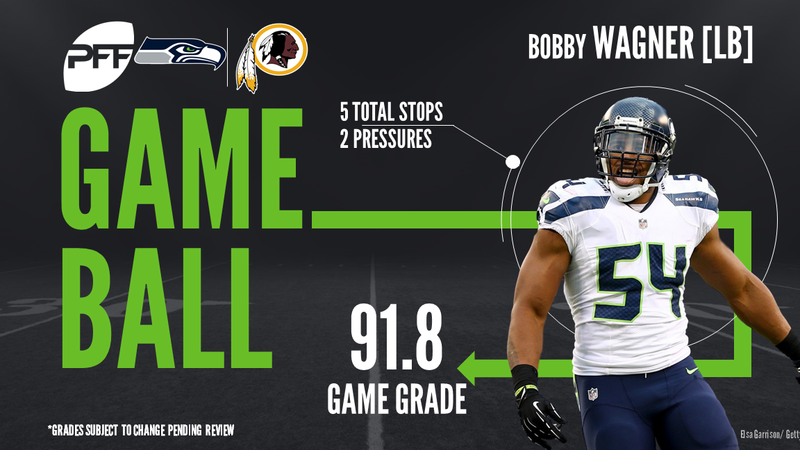 Dwight Freeny picked the right game to make his Seahawks debut in, going against a depleted Redskins offensive line, Freeny had a field day and Washington witnessed his patented spin on numerous occassions. All of Freeny’s pass-rush snaps came from the right side, pitting him mostly against backup LT T.J. Clemmings, he recorded two sacks and six total pressures from that side which gave him a pass-rush productivity of 21.7, tied for tops among 4-3 defensive ends in Week 9.